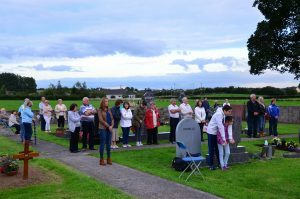 KILKEEDY MASS: The annual mass in Kilkeedy Graveyard for all our deceased relatives and friends was celebrated by Fr. Michael Cussen PP. on last Friday evening August 26 at 7.30pm. A large attendance turned out and we were blessed with a fine evening. 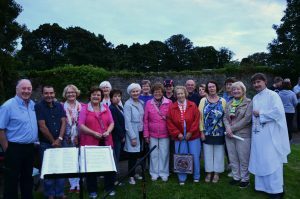 A big thank you to our Ballybrown Church Choir led by P.J. Carroll with Rosaleen Donovan on the organ. They added greatly to he occasion. 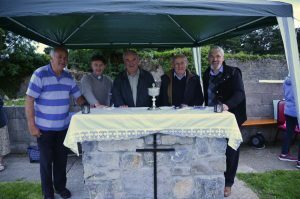 Thanks to our neighbours the O’Gorman family for allowing us the use of their electrical power for the duration of the mass. Thanks to Declan Tierney and Adrian McGann for looking after the amplification. A big thank you goes to our team who looked after the parking of the cars. 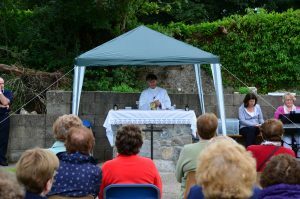 Thanks to the people who built and prepared the altar for the occasion. This ensures that we now have a permanent location for our altar. 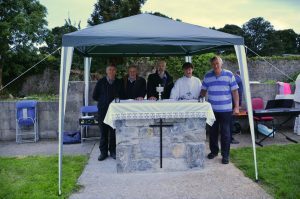 Thanks to Jimmy O’Neill, Breska and Bertha O’Grady, Banogue for their generous donation of an altar slab and the altar cloth. 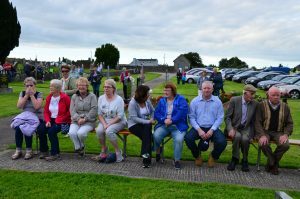 A big thank you to Michael Byrnes and the Ballybrown GAA Club for the use of their chairs and benches which add greatly to the comfort of the congregation, especially the elderly. 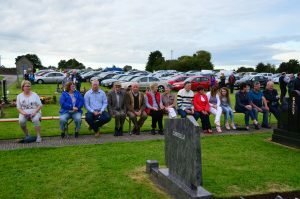 Thanks to Seamus Coughlan our caretaker and Vincent Kelly for having the graveyard in such wonderful condition and for their time and effort in ensuring that Kilkeedy is a final resting place to be proud of. 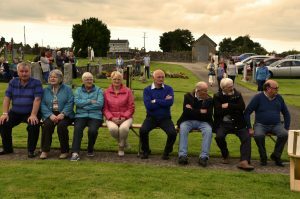 Thanks to all or supporters who gave so generously in the collection for the graveyard upkeep, this is our only means of funding and we appreciate your financial support. Finally thanks to all who helped in any way to make the occasion once more a great success. Go raibh Maith agaibh go leir. RURAL EMPLOYMENT & EDUCATION SERVICE: Are you looking for some support and guidance to help you get back into training or back to work? The Rural Employment Service is a free confidential service based in Newcastle West providing career guidance supports, CV and interview preparation supports and advice on training and education courses. Contact the following at West Limerick Resources, Finn (087 759 1951), Adrienne (087 277 3294), or like us on Facebook WLR Rural Employment Service for the latest updates on job vacancies and training courses. 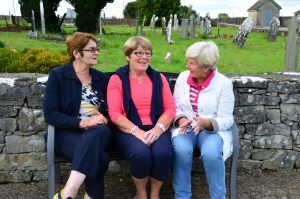 PHONE CONNECT SEEKS PARTICIPANTS: The Phone Connect Project is a free community based telephone support service offered to older people in the West Limerick Area empowering them to remain independent in their own homes. The weekly service provides a listening ear to the elderly allowing them to share any worries or concerns and to be informed of any local events or services. West Limerick Resources are now seeking participants, particularly those experiencing isolation, who would like to receive a weekly phone call. If you would be interested in receiving or require more information we would be delighted to hear from you by calling Damien at West Limerick Resources on 087 9042477 or Stefanie on 087 3290483. This initiative is being run in association with the Rural Community Care Network (RCCN). POETRY READING: There will be a POETRY READING by poet Brendan MacCarthaigh in the Resource Centre on Wednesday September 7 at 8.30pm, organised by Jim O’Farrell. Brendan, a Christian Brother in India for more than 50 years, has had the privilege of welcoming Jim and his friend Fr Pat Hogan with his group Calcutta Calling to India several times. Free admission. All welcome. OPEN NIGHT: An Open Night will be held in the Resource Centre on Thursday September 1 from 7.30pm to 9.00pm. Information and registration will be available for all the classes available in the Centre. There are a variety of courses for adults and children. Tea and cake will be served. BAG PACKING EVENT – VOLUNTEERS NEEDED: We have been fortunate to secure a slot for a fundraising bag packing event in Dunnes Stores, Jetland Centre on Friday September 2 and Saturday September 3. We will be there from 10am to 10pm on Friday and 10am to 6pm on Saturday. We would really appreciate some help. All money raised will go towards further reducing the outstanding debt on the Resource Centre.If you can help us for an hour or two on either day, please contact Ann Davoren 087 2122842 or Tracey McElligott 087 9591790 or your Community Council Representative. 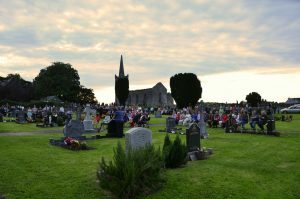 KILKEEDY GRAVEYARD MASS: The annual mass for our deceased relatives and friends takes place at Kilkeedy Graveyard on Friday evening Next August 26 at 7.30pm. 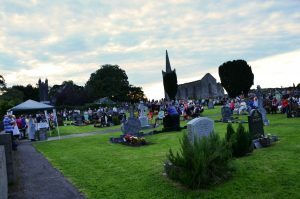 A collection for the upkeep of the graveyard will be taken up at this mass and as it is our only means of funding annually we would ask you to be as generous as you can. Thanks.